It took a lot longer than I wanted, and it is really far from perfect, but it is pretty satisfying to see it all done. I’ve made some shelving and stuff before but this is the first thing I have made that wasn’t destined for a basement or garage. My plan to finish a small woodworking project each week took a bit of a hit, but hey, nobody’s perfect. On top of that, my son came 5 weeks early, so it wasn’t quite on time. I’ve been learning a lot about woodworking online lately, and really enjoy when people post their thoughts on a project, so I thought I would do the same. I had a lot of trouble finding plans that I liked for this. 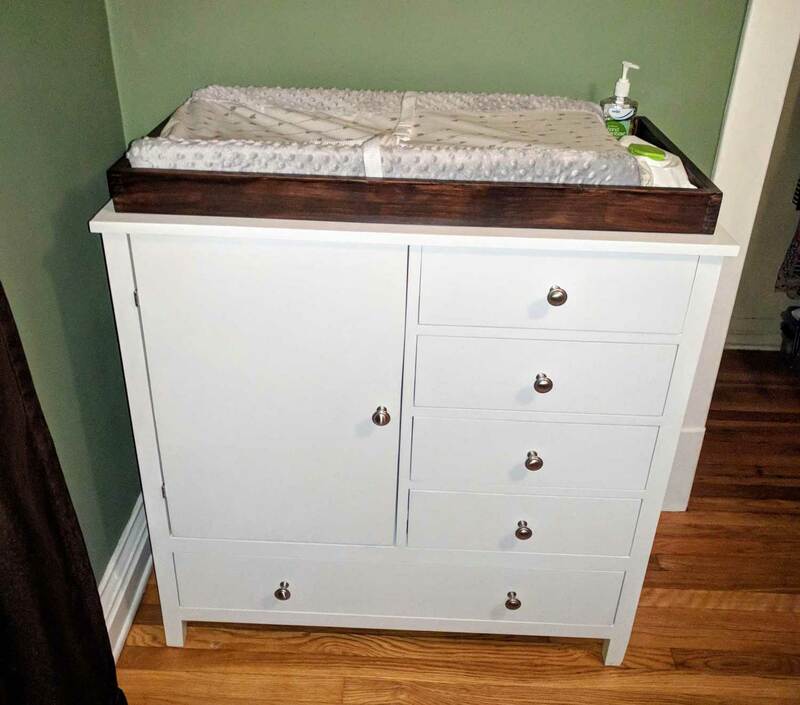 Originally, I had wanted to make a simpler version of a changing table that I had found online here. My wife wasn’t a fan of the open design because she thought it would look messy when it was full. I then looked around at plans online and decided to make a split dresser with drawers on one half and a section for hanging clothes on the other. I’m glad she said something because this is a lot more practical for us, especially since what we really needed was storage for clothes. I found a few designs, but none that worked exactly, I decided to roughly follow this design, but substitute dowels to hold the panels together and box joints for the drawers. I also made the changing pad holder a separate piece and just attached it with mending plates in the back so that once we don’t need it anymore we can take it off and just use it as a dresser. All in all, it went fairly well, but took a lot more time than I was anticipating, and cost a bit more as well. It’s all made of pine, the larger panels are all pine plywood. It hurt to have to buy the nicer “select” grade pine but I think it was the right call in the end. I ended up making the top from a piece of edge-banded 3/4″ plywood I had left over from the sides to save some money, as I was planning on putting a changing pad holder on top of it anyways. The doweling jig I bought was pretty easy to use and I will definitely make some more things using it. The pocket screws were quick and easy, I borrowed a jig for this project, and it’s definitely on my list of things to get now. I tried making a cross-cut sled before I started to help get accurate cuts. I didn’t do a ton of research and it turns out I made all the mistakes I would read not to make later. It was huge, way too big to use easily, and I made the runners too short, so when I got all the way to the end of a cut it started losing its accuracy and wiggling. As a result, I spent a few nights and a Saturday making something that I promptly set in the corner in anger and haven’t moved since. I also made a tapering jig to taper the legs and that worked pretty well. I needed a jointer jig as well, so I kind of cheated and went for a two in one. The clamps on the risers were for the 2×2’s that I tapered, the ones without can hold 1/2″-1″ boards to prep them for jointing. Got the clamps at Harbor Freight so it was pretty inexpensive. To use it to taper, I just eyeball how much I want to taper, clamp a stop block on the end and a scrap piece in the middle that pushes the far end out how far I need. It’s not high tech or probably the best way to do it, but it worked great for me. Speaking of tapered legs, if you look close, the taper on the front right leg is going the wrong way, I wasn’t paying attention when I drilled the dowel holes and I didn’t have any more 2×2 stock so I left it. Oh well, adds character right? Finishing took a lot of time. I painted the dresser itself with semi-gloss white paint we had left over from the trim in our house and top coated it with spray on polycrylic. I decided on polycrylic as a top coat because I assume this thing will be getting peed on a lot. I finished the drawers with spray lacquer. I went with lacquer because it dries so fast, I was able to knock out all of the drawers in an afternoon. The top I finished with a stain and polyurethane in one. I went with the two in one to save time, since the child it was for was already 8 weeks old at that point. It doesn’t look great, but since it is mostly covered anyways I just put the best side forward and called it good. I had wanted to turn my own drawer pulls, but with the timeline so far behind, I just bought some. My wife picked them out, she has a better eye for it than I do and I really liked them. If you are starting out, don’t go for inset drawers, they are a real pain to get right. If you are only using one pocket screw to attach something, you need to really clamp it in place to keep it from swiveling, I had all kinds of issues with the small 1×2’s in between the drawers, I ended up putting a clamp on the side piece right above and below them and that worked out okay. When you attach the drawer slides to the drawer, make sure you leave some room so you can adjust them. I butted them all the way to the front at first, then when I was working on flushing them tot he cabinet, if the drawer was too far out I had to take the whole thing off and move it back. Finishing takes just as long if not longer than building. If you asked me anytime in the last three to five weeks, I probably would have told you I will never do anything like it again. Now that it’s done, I can say I totally will, but I think I might stick to smaller things for a while.